Bicentennial Ambassadors (from left) Cooper Schagel, Grant Adams, Mattison Finlaw and Brielle Newland conducted the Bicentennial Marker ceremony. The Bicentennial Marker in Bedford Township. Bicentennial Ambassadors (from left) Brielle Newland, Mattison Finlaw, Grant Adams and Cooper Schagel. BEDFORD TWP. 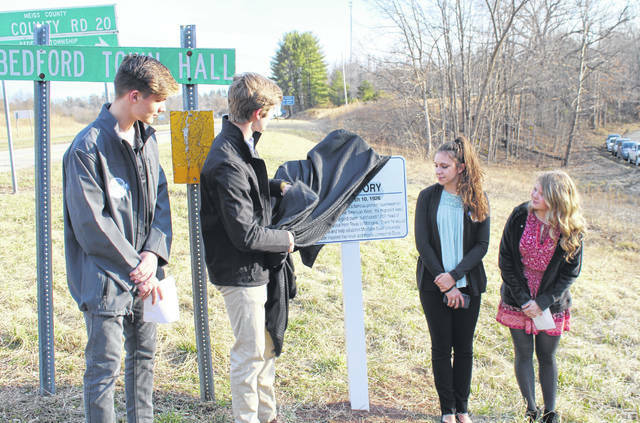 — Meigs County’s third Bicentennial Marker was unveiled last week in Bedford Township. 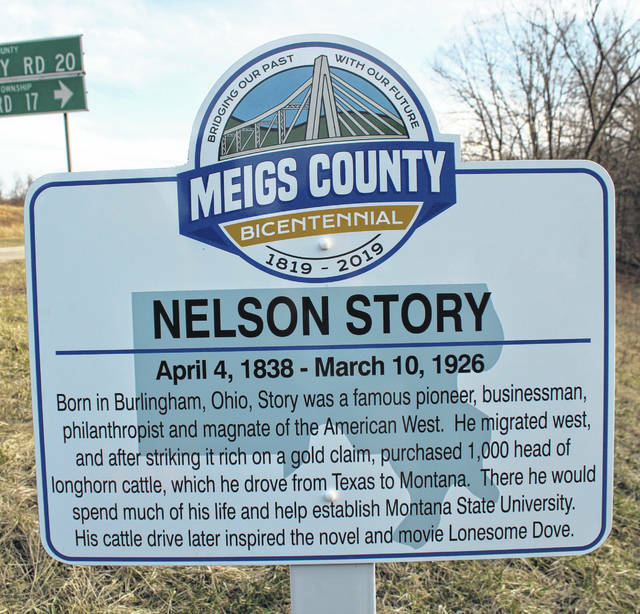 The Bedford Township marker is in recognition of Nelson Story, who was born in Burlingham in 1838. The marker was placed at the intersection of U.S. Route 33 and Bedford Town Hall Road (the last road to the left on the four-lane coming from Pomeroy toward Athens). Bicentennial Ambassadors Grant Adams, Cooper Schagel, Mattison Finlaw and Brielle Newland led the unveiling ceremony, reading information about Story’s life. In an column last fall, local historian Jordan Pickens wrote about Story. By June, Story had mined about $30,000 worth of gold around Alder Gulch, Montana. By today’s standards, Nelson Story would have mined nearly $607,000 worth of gold. During his tenure in Montana, Story went on to become a charter member of one of Montana’s first Masonic lodges, as well as served on a vigilance committee, a group voluntarily enforcing law and order. Story decided to trade his $30,000 worth of gold for $20,000 cash. Previous markers have been place in Salisbury Township in recognition of the Kerr’s Run Colored School and Sutton Township in recognition of Weaver Skiff Works. 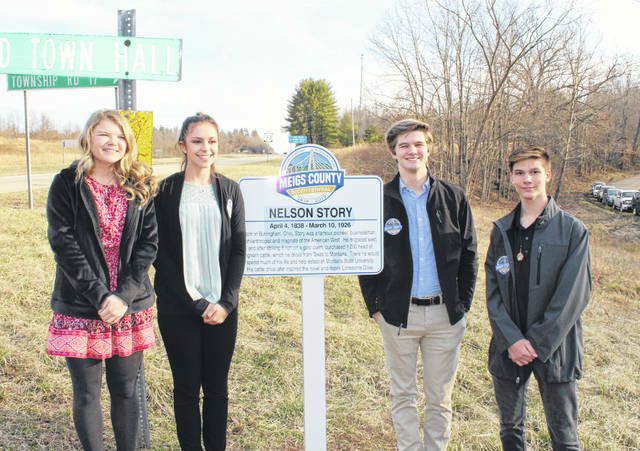 The next Bicentennial Marker will be placed the third Wednesday in April in Letart Township with the time and location to be announced closer to the event. https://www.mydailysentinel.com/wp-content/uploads/sites/14/2019/03/web1_3.26-Bicentennial-1_ne201932513444421-1.jpgBicentennial Ambassadors (from left) Cooper Schagel, Grant Adams, Mattison Finlaw and Brielle Newland conducted the Bicentennial Marker ceremony. https://www.mydailysentinel.com/wp-content/uploads/sites/14/2019/03/web1_3.26-Bicentennial-2_ne2019325134446759-1.jpgThe Bicentennial Marker in Bedford Township. https://www.mydailysentinel.com/wp-content/uploads/sites/14/2019/03/web1_3.26-Bicentennial-3_ne2019325134450460-1.jpgBicentennial Ambassadors (from left) Brielle Newland, Mattison Finlaw, Grant Adams and Cooper Schagel.